Discussion in 'iPad Games' started by magixfingers, Jul 16, 2011.
Who said chickens can't fly?! Make them flap their tiny wings! Journey through beautiful hills to help little chickens find their moms. Use the one-finger touch play to jump, until this annoying gravity brings you back down to earth. ▪ Incredibly simple and addictive gameplay. ▪ Dazzling hi-res graphics optimized for Retina Display. ▪ Game Center integration with leader-board and achievements. ▪ Acquire new "Power-Ups" to use special skills and earn achievements. We've got our first app all the way to #1 and we couldn’t be more ecstatic that "Run, Run, Chicken" (iPAD and iPhone version) occupies pole position in 139 App Stores worldwide and the game has been downloaded 1.8m times since we launched it 2 weeks ago. We are submitting v1.1 update this weekend. What's in v1.1? Ok, more "Power-Ups", new levels, new achievement system and many more goodies in store for you. Here's some screenshots. Enuff said. Back to the app mine. The game is also ridiculously simple and addictive. It has filled millions of those interstitial moments spent riding the bus, on a plane or in important work meetings, and it is or has been the number-one free app on iTunes in 139 countries. Hereâ€™s the video for the v1.1 update. We just submitted to Apple App Store. You get new weapons, a new achievement system and plenty more. v1.1 Update submitted to App Store today! Take a peek at the new graphics. Thank you, guys. 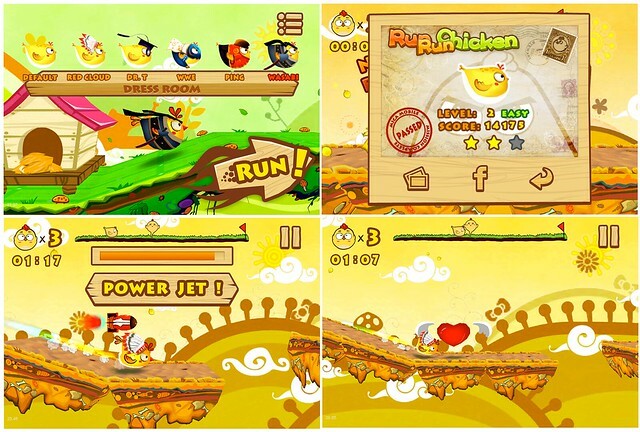 "Run, Run, Chicken" tops the chart in US App Store, 17/07/11. We are the No. 1 (Adventure, Action), No. 2 (Overall FREE App & Overall FREE Games). â€œRun, Run, Chickenâ€ tops the US App Store chart. We toppled â€œAngry Birdsâ€ off the chart and is now the NO. 1 â€œAdventureâ€ (FREE), â€œActionâ€ (FREE) game, and NO. 2 Overall FREE Apps and Overall FREE Gamesâ€¦ Every day, users spend 37,753,280 million minutes â€” 264 million minutes every week â€” playing the mobile game. And we are numero uno in 139 App Stores and TOP 5 in 217 App Stores. "Run, Run, Chicken" v1.1 for iPAD is now available for download @ the App Store. Go try. Besides bug fixes and other UI enhancements. We added more "weapons" to help little chicken clear the huddle and an improved achievement system. Watch this video demo. "Run, Run, Chicken" crossed 2.9m downloads! "Run, Run, Chicken" surpassed 3m downloads this morning. Thank you!